Over the past couple years, the Pacific Institute’s Corporate Sustainability Program, in its role with the UN Global Compact’s CEO Water Mandate, has been developing the Corporate Water Disclosure Guidelines, which provide a common framework for how companies can report water-related information to stakeholders in a meaningful manner. One of the core goals of this effort is to encourage companies to report their water-related information in a more harmonized way, so that companies are thinking and talking about water in a similar, more comparable way. One obstacle to more harmonized water reporting is the fact that many companies, stakeholders, and corporate water assessment tools do not have a shared understanding of key water-related terms used in disclosure. In particular, many companies and others use the terms “water scarcity,” “water stress,” and “water risk” (often used to indicate geographic areas where water challenges are more pronounced) in a variety of ways and often interchangeably. For example, some companies report water use reduction specifically in areas of water “scarcity,” while others report water use reductions in areas of water “stress.” In other cases, many companies refer to areas facing water stress, but actually mean different things. Recognizing this challenge, in May 2013, the CEO Water Mandate Secretariat initiated a dialogue among organizations developing corporate water tools and other initiatives, including the Alliance for Water Stewardship, Carbon Disclosure Project (CDP), Ceres, The Nature Conservancy, Water Footprint Network (WFN), World Resources Institute, and WWF, to see if we could reach a shared understanding of what these terms mean and how they relate to one another, especially as they apply to corporate water stewardship. “Water scarcity” refers to the volumetric abundance, or lack thereof, of water supply. This is typically calculated as a ratio of human water consumption to available water supply in a given area. Water scarcity is a physical, objective reality that can be measured consistently across regions and over time. “Water stress” refers to the ability, or lack thereof, to meet human and ecological demand for water. Compared to scarcity, “water stress” is a more inclusive and broader concept. It considers several physical aspects related to water resources, including water scarcity, but also water quality, environmental flows, and the accessibility of water. “Water risk” refers to the probability of an entity experiencing a deleterious water-related event. Water risk is felt differently by every sector of society and the organizations within them and thus is defined and interpreted differently (even when they experience the same degree of water scarcity or water stress). That notwithstanding, many water-related conditions, such as water scarcity, pollution, poor governance, inadequate infrastructure, climate change, and others, create risk for many different sectors and organizations simultaneously. “Water scarcity” is one aspect of many that contributes to and informs “water stress.” An area could conceivably be highly water stressed, but not water scarce, if, for example, it had egregious water pollution, but plentiful supplies of contaminated water. 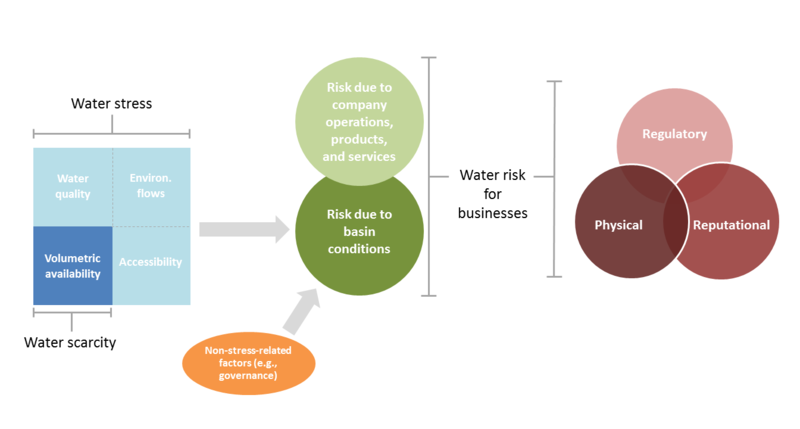 “Scarcity” and “stress” both directly inform one’s understanding of “risks due to basin conditions.” Companies and organizations cannot gain robust insight into water risk unless they have a firm understanding of the various components of water stress (i.e., water scarcity, accessibility, environmental flows, and water quality), as well as additional factors, such as water governance. A more detailed explanation of our initial findings and how speaking the same language with these terms can advance sustainable water management can be found in our draft discussion paper here. If you have suggestions for ways to strengthen or better align this work with existing efforts in the field, comments are welcome to pschulte (at) pacinst.org.